January 30th, 2019: Like many Pitney Bowes employees, alumni, and retirees, I was shocked and saddened by the sudden death of Ken Petersen, who passed away suddenly at the age of 59. we also know that his positive legacy will remain and continue to grow! December 23rd, 2018: Like many Pitney Bowes employees, alumni, and retirees, I was shocked and saddened by the sudden death of Ken Petersen, who passed away suddenly at the age of 59. we also know that his positive legacy will remain and continue to grow! December 23rd, 2018: I recently read Bad Blood by John Carreyrou, the reporter who broke the story of the massive fraud that brought down Theranos, the high-flying Silicon Valley company founded by Elizabeth Holmes. Bad Blood added more context to the story. December 4th, 2018: Over the years, I have often wondered why I undertook and stayed with a process that took almost 10 years to get the film From the Rough produced and released into theaters. 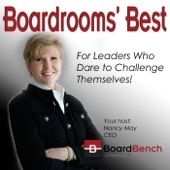 November 23rd, 2018: In this episode of Boardrooms Best, Nancy May speaks with Mike Critelli, corporate director and former CEO of one of the most recognized Fortune 500 companies, about how he and his board peers bring out the best from the company leaders they oversee. November 8th, 2018: I am confident in its future, but also recognize the immensely difficult odds its faces. I look forward to celebrating the company’s 100th anniversary in 2020 with the rest of the Pitney Bowes family. October 29th, 2018: There is no border control between Ireland and Northern Ireland, although there may be one after the Brexit effective date, March 29, 2019. How the border and governance issues will be addressed is still uncertain. June 2nd, 2018: We should be very reluctant to institute online sports betting or other forms of online gambling. Once the “genie is out of the bottle,” it cannot be put back in. March 9th, 2018: Dave’s platform, his character, and his skills give him many of the prerequisites for a great candidate and for serving as Connecticut’s Governor. However, I did not characterize him as the “best candidate” for Governor because it is too early. January 16th, 2018: As I have announced on the From the Rough Facebook page, two cable TV networks have secured the rights to broadcast our film, BET Network and The Golf Channel.